The planned increases are significant, with 3 in 10 planning to increase spending by 31% or more. In addition, 4 in 10 planned to increase their budget by up to 31% and 15% expected no change. 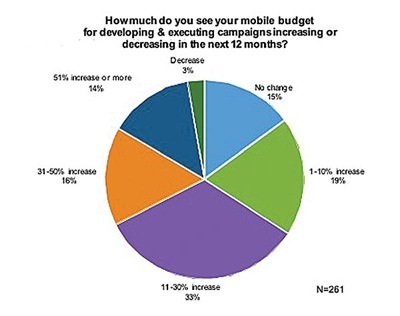 Only 3% planned to cut their mobile advertising budget. The figures also showed that half of current budget comes from Online, 35% from cross-platform, 27% from a “mobile specific budget” and 8% from TV. With the current hype surrounding apps it is not surprising that branded applications are showing the most interest from advertisers (47%), followed by mobile video (44%) and coupons (39%). Interestingly when it came to ROI, it was the less fashionable formats that had the advertisers favor with mobile coupons (36%) followed by text links and banners (26%).